The Bad Kitty Bakery: Going to the Movies! I love going to the movies. When I was an omnivore (or Muggle as I like to call them) going to the movies held a few extra joys. Giant sodas, massive boxes of candy, and buckets of popcorn that were bigger than my torso. I would eat and watch and eat more… then I would leave the movie logy and full of calories. Little did I know that bucket of popcorn had more calories than I was supposed to be eating in a day! No wonder I was gaining weight and feeling badly. Once I started eating vegan, I noticed there was little or nothing I could have at the movies, other than a bottled water for $4. I would have been happy to pay for fresh fruit or even baby carrots, but there were none to be found. The week I became vegan, I was due to watch a Friday morning movie with a friend. I knew I didn’t want any of the unhealthy food or candy so I brought dried blueberries. I bought two packages, one for me and one for my friend. I ate mine, she ate hers, and both of us were full of energy and fiber when we left the theater. That started a tradition. Now, I always bring my snacks to the theater. If you are a guy, it’s harder. Settle for dried fruit or nuts. Place them in a baggie and throw them in your pocket. Women, you have more options. Just think about what you can fit in your purse. I have included a picture of what I brought to watch Evil Dead this morning. I brought slices of organic fuji and red delicious apples, and organic peanut butter chocolate truffles. I also brought a bottled water for both Jason and I. Our friends ate popcorn, but I had a great time chomping away on my apples. I didn’t even finish what I brought even though I had not yet eaten breakfast. I left the movie today feeling full, hydrated, and refreshed. 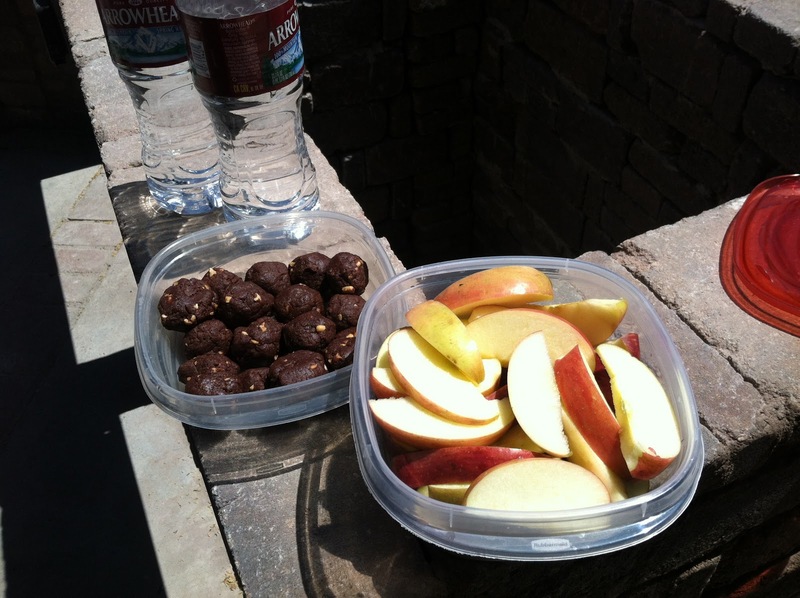 Bring your own food and your own snacks when you go places. Only you know what your body needs on any given day. Listen to your body, and bring the fuel it needs to pick up and go.